Enfield has a rich history and the Enfield Public Library is in the process of making that history more accessible to the community. By working with community partners like the Enfield Historical Society, the Connecticut State Library and the Friends of the Enfield Public Library, we have been able to digitize historic issues of the Enfield Press and the Yale Photographic Collection. Local newspapers are one of the most valuable tools for conducting genealogical research. 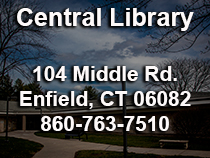 The Enfield Public Library has been digitizing our Enfield Press Collection over the course of the last few years. 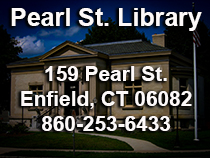 The Connecticut State Library currently provides online access to the first piece of that collection (1880-1922). You can access 1923-1959 by stopping in and asking about it at the Reference Desk. Frank Pease Barn on King St. In 1909 Reverend David Lewis Yale of the First Congregational Church took his camera and documented life in Enfield. It is a truly unique snapshot of life in the first decade of the 20th Century. The Friends of the Enfield Public Library worked with Fred Bird Photography to digitize the glass slides. Reverend Yale gave slideshows with these images in the 1940s and the original notes that he used for the presentations are included to describe the photographs. The Enfield Historical Society is a non-profit all-volunteer organization; whose mission is to preserve the history of Enfield, Connecticut and to educate the public about town history. To achieve these goals the Enfield Historical Society operate museums, collect artifacts and information pertaining to the Enfield's history, and conduct demonstrations, tours, regular meetings and other special events. Former Enfield resident, Bob Milner, generously shared scans of his image collection. Includes Enfield/Thompsonville postcards and images of 1955 Flood. Current Enfield resident John Malley's photographs of the 1955 flood in Enfield, CT. The collection also contains other images not from the flood such as images of Thompsonville.